Frank Burke is our 2012 Club Champion. The result was announced at the Racing795 end-of-season party in Ferns last Saturday night. Frank was presented with the Championship trophy by last year’s winner, Lorraine Byrne. Frank had a long and busy season, starting early in the year with the long drive to Valentia in Co Kerry. He competed in 9 triathlons including 4 sprints, 4 Olympics, and just recently, a half Ironman. Between races Frank is ever present at club training sessions, and is always on hand to offer help and support to club mates. That’s what Racing795 is all about, so Frank is a popular and deserving champion. 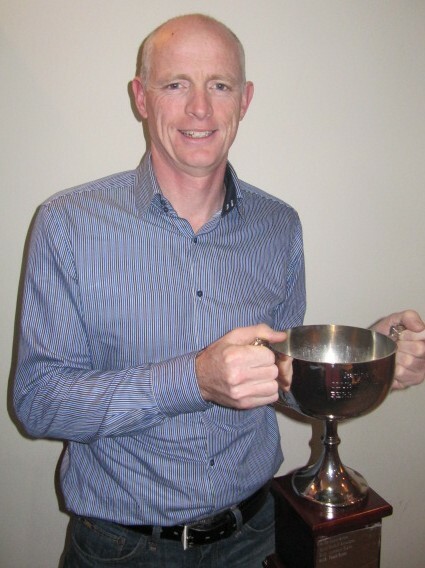 Club championship runner-up this year was David Furlong who scored well in early season Mountain Bike races. New boy Fintan Redmond took third place in his first full season with the club. Frank Burke was also presented with the 2012 Summer League trophy to add to his Winter League success back in January. That’s a clean sweep for Frank in 2012 making him the man to beat next year. Looking forward to it already! Tom Hogan was presented with a special award in recognition of representing Ireland at The World Mountain Running Championships.